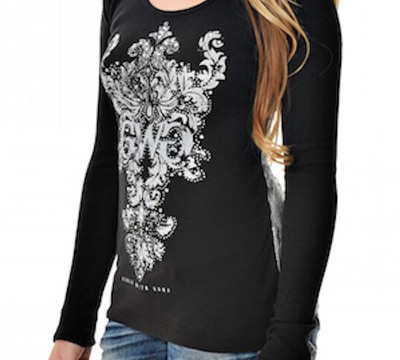 Dare to bare in this lace-back top from Girls with Guns® Clothing. Featuring a lightweight, waffle thermal-type fabric with plenty of stretch, a full lace back panel, and a glitter scroll front logo accented with decorative stones, the Lace Top is a show-stopper! Features include: Black body with gray lace back, Gray screen printed scroll motif with clear stones, Body: 50% Polyester 50% Cotton, Lace: 80% Cotton 20% Nylon, and imported. Made by Girls With Guns®. LIMITED TO STOCK ON HAND. NO BACKORDERS. SOO lovely. SOO feminine. Im speechless really. It got here 2 days before expected, & the quality plus the PACK job was brilliant. The neckline is perfect. I bought the Ruger short sleeved shirt as well , It was marvelous. I live n New York City. Manhattan . I wear this proudly. RUGER . I HATE YOU! Now I want ALL OF THEM, PLUS OTHER THINGS as well. Im addicted ! Cheers all . Carry on .